Capable of reaching speeds up to 55 MPH and climbing to altitudes of nearly 5000 ft. WARNING: Only fly this Quadcopter in compliance with Local and FAA Regulations. Free IOS/Android App for Monitoring & Control from your Smartphone.Please refer the User Manual before use. 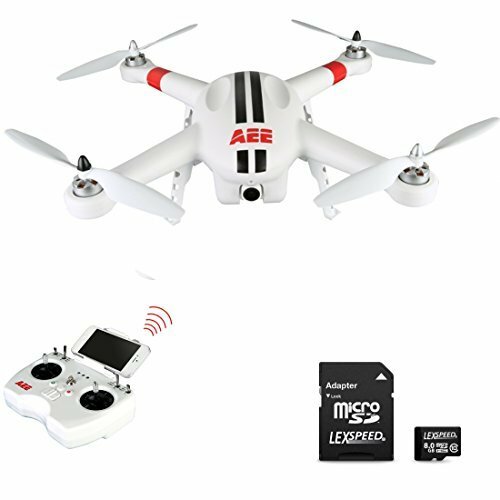 The AP10 Quadcopter lets you experience the best in Quadcopter flying and Video capture. The high capacity 5300 mAh Lithium Polymer battery provides you with up to 25 minutes of quality flying time. You get professional videos and stills with the integrated 16mp Full HD camera. The camera tilt is controlled remotely from the Radio Transmitter with a dedicated tilt control lever. The drone also streams a live video feed back to pilot to frame up the perfect shot via the Wi-Fi range extender/repeater and the AEE Aerial Photography App available for free download for iOS and Android Mobile Operating Systems.